10 things you might not know about RAIDERS OF THE LOST ARK | Warped Factor - Words in the Key of Geek. Geek Dave serves up 10 interesting bits of trivia you might not know about Raiders of the Lost Ark. 1. 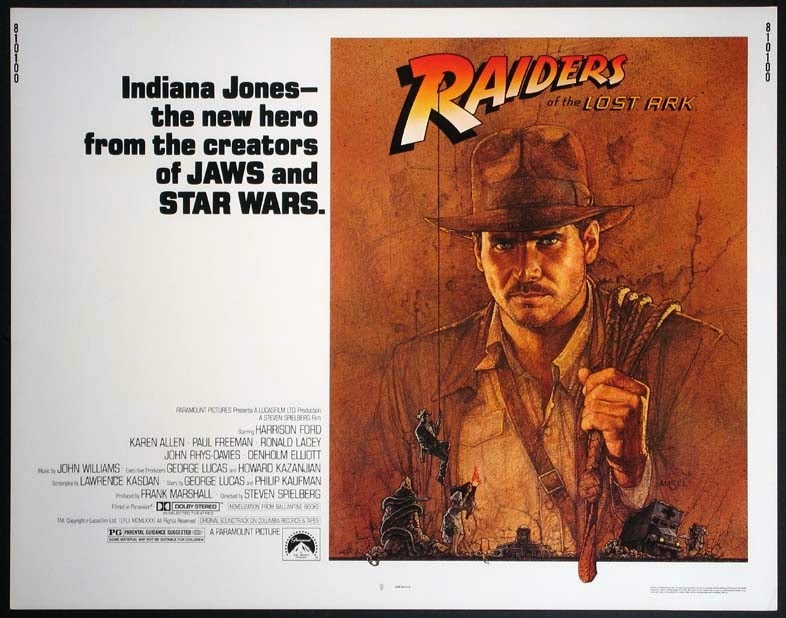 George Lucas came up with the original idea for what would be Raiders Of The Lost Ark back in 1973. He had an idea for a movie titled 'The Adventures Of Indiana Smith" which, like Star Wars, was inspired by his love of the Flash Gordon and Buck Rogers serials. 2. That name, Indiana Smith, stayed all the way until the first day of production when Steven Spielberg felt it didn't sound right. He suggested they use Jones instead. 3. Amongst the actors in contention for the role of Indy were Bill Murray, Nick Nolte, Steve Martin, Nick Mancuso, Chevy Chase, Peter Coyote, Tim Matheson and Jack Nicholson. Jeff Bridges was offered the part but turned it down. Spielberg wanted Harrison Ford, but Lucas wasn't initially keen to team up with his former carpenter again, so Tom Selleck was sought out. However, TV commitments kept him from the role and so Ford was approached. The rest is history, as they say. 4. The often imitated opening sequence with the big rock was actually inspired by a Scrooge McDuck comic strip from 1954 which Steven Spielberg had read. Entitled 'The Seven Cities of Cibola', in the comic an idol is lifted off of its pedestal, triggering a giant rock which nearly crushes the thief. 5. You remember when Marion says to Indy "I was a child! I was in love! It was wrong and you knew it!". She's referring to their affair from years earlier. Although it's never explained in detail in the films, according to Lucas' treatment Marion was just 14 (yes, 14!) at the time her and Indy first got together. Indy was 25. Their relationship lasted two years before Indy left. A little creepy eh? 6. Actor and Wrestler Pat Roach not only played the imposing mechanic who gets killed by the planes rotor blades, but also the giant Sherpa who dies in the Nepalese bar. Roach would return for the next two Indiana Jones films, he was the chief Thuggee guard in Indiana Jones and the Temple of Doom and then played a member of the Gestapo in Indiana Jones and the Last Crusade. 7. The canyon where Indy threatens to blow up the Ark is the exact same one where the Jawas take R2-D2 in Star Wars. 8. Talking about R2-D2, both the little Droid and his companion C-3PO appear in hieroglyphics in the Well of Souls scene. 9. During the scene involving Indy, a bazooka and a group of Nazis, a fly landed on the face of Dr Belloq. You can clearly see it crawling about in the image above. This scene had been shot many times already and the actor, Paul Freeman, wasn't keen on there being another take, so he didn't react to the fly, he didn't even attempt to shoo it away. Eventually it ended up in his mouth and, being the professional he is, he swallowed it! Nice eh? 10. 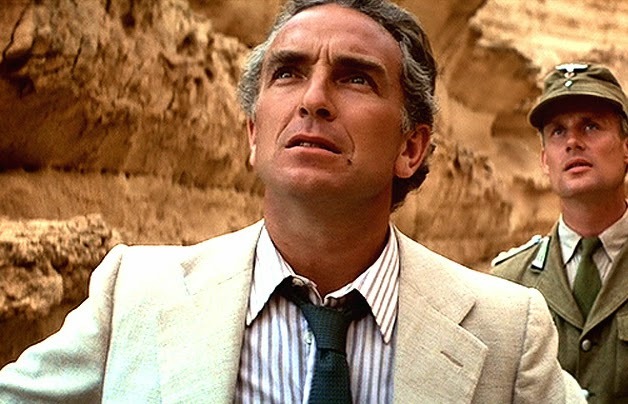 Originally Raiders of the Lost Ark saw Indy traveling to Shanghai to recover a piece of the Staff of Ra. 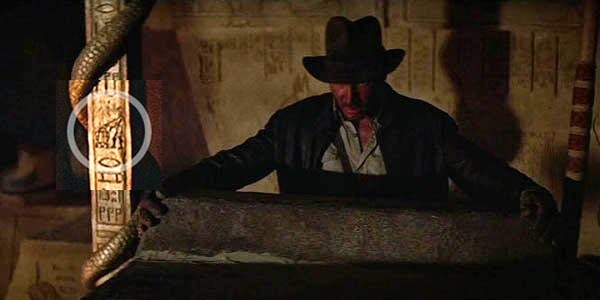 The script saw Indy using a giant gong to shield himself from gunfire and then taking part in a mine chase. Both sequences were eventually used in Indiana Jones and the Temple of Doom.